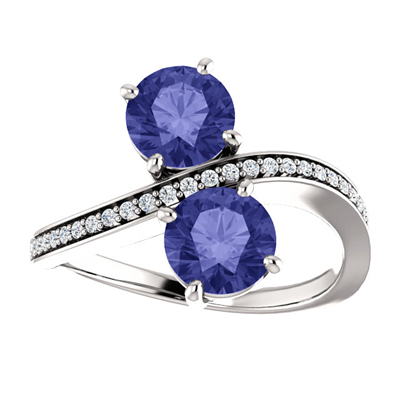 Apples of Gold presents you with an tanzanite and diamond dream with their "Only Us" two stone ring set in 14 carat white gold. The 14 karat white gold ring is a true show stopper. Topped with a diamond cut tanzanite gem that measures 6mm with a total carat weight of 0.13 and is set by our jewelry experts, in a 14 karat white gold band. We guarantee our "Only Us" Tanzanite and Diamond Two Stone Ring in 14K White Gold to be high quality, authentic jewelry, as described above.